The beloved Bulldawgs of Georgia cruised to an easy victory against a first-game patsy, thumping University of Louisiana-Lafayette, 55-7. 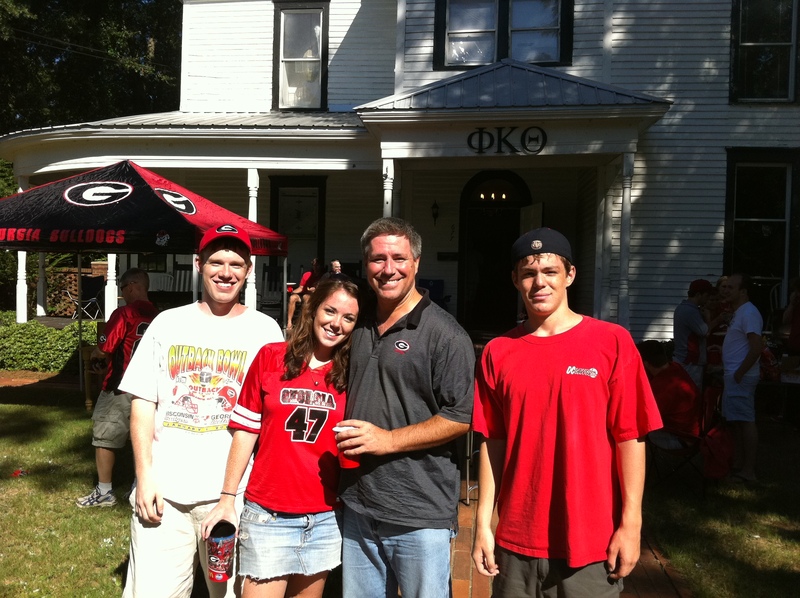 Here am I with the three kids, who have been indoctrinated to loathe government and love Georgia. Here’s some horrifying news from the United Kingdom, where the government-run healthcare system allowed 239 patients to die of malnutrition in 2007. Another 8,000-plus entered the system for malnutrition and actually deteriorated. In 2007, 239 patients died of malnutrition in British hospitals, the latest year for which figures are available. A wag might say it must be the English cuisine. But the real roots of this tragedy lie in Britain’s government-run medical system, which tells us something about what we might expect from ObamaCare in the years ahead. A British charity, Age U.K., has been seeking for years to raise awareness of the issue. Yet despite increases in screening, training and inspection programs, the problem has only gotten worse. The charity reports that in 2007-2008 148,946 Britons entered hospitals suffering from malnutrition and 157,175 left in that state, meaning that hospitals released 8,229 people worse-off nutritionally than when they entered. In 2008-2009, that figure was up to 10,443. The problem is not a lack of food. Hospital malnutrition mostly affects the elderly or otherwise frail, who often need individualized mealtime assistance. Spoon-feeding the elderly may not seem like the best use of a nurse’s time, but for some it may literally be a matter of life and death. Yet the constant scarcities created by government medicine, along with the never-ending drive to trim costs, has led the National Health Service to give nurses additional responsibilities and powers in recent years. Inevitably, this leaves them with less time to make sure patients are getting fed. No system is perfect, so the point of this post is not to assert that there is something especially inhumane and/or incompetent about the British system. Instead, the real lesson is that doctors and hospitals generally try to please the people paying the bills. In government-run systems, that means appeasing politicians. This doesn’t preclude good patient care, but it does mean that other factors may have too much of an impact on decisions. In a market-based system, though, medical professionals have a greater incentive to focus on patients. I should also say that this is not an endorsement of the American system, which also suffers from the third-party payer problem. In part, this is because of direct government financing, but also because of excessive use of insurance caused by government-created distortions. If Professors Really Believe in Socialism, Why Don’t They Try this Classroom Experiment? This little story appeared in my inbox. It’s obviously meant to illustrate the perverse incentive structure created by redistribution, but one wonders why statists in the academic world don’t follow through on their convictions and use this grading system. A professor said he had never failed a single student before but had, once, failed an entire class. The class had insisted that socialism worked and that no one would be poor and no one would be rich, a great equalizer. The professor then said ok, we will have an experiment in this class on socialism.